Our new Service 18 will soon be here! From 28 April we're launching a new bus from Market Weighton, Holme on Spalding Moor, Bubwith and Wheldrake to York Designer Outlet and York City Centre. 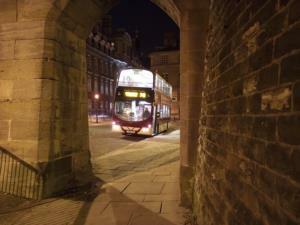 The Service 18 will run about eight journeys a day, plus extra buses on Friday and Saturday nights. It gives Holme on Spalding Moor and other village residents a link through to York, plus there's a brand new place to visit with EYMS - York Designer Outlet! York Designer Outlet is where you can find your favourite brands at up to 60% off, all year round. It has a beautiful setting, cafes and restaurants, and more than 100 boutiques, with iconic brands such as Hugo Boss, Ted Baker, Polo Ralph Lauren, L.K. Bennett, Reiss and many more. Special introductory offer! Catch our bus to York Designer Outlet and show your ticket and bus timetable and you can claim a special one-day 10% discount card for use in selected outlet stores! For more information pick up a timetable leaflet. Holme on Spalding Moor shops and cafes. York Bus Info Point in York Rail Station. If you're in one of the villages on the route which doesn't have a shop/post office ring 01904 551400, and we'll post a timetable out to you. New Service 18 replaces Service 34H between Holme on Spalding Moor and Market Weighton. There are also minor changes to Sunday Service 18A. Travelling from Hull, Beverley or Pocklington? Use Service X46 to Market Weighton, then catch new Service 18 to the Designer Outlet.